St. Serapion’s life reads much like a medieval action-adventure drama, but it’s his death that we are left to meditate on. Accounts conflict about Serapion’s origins—some say that he was born in England, others in Ireland or Scotland. What is known is that he was a soldier in the army of King Richard I (the Lionheart) and later that of Leopold VI, Duke of Austria. He then went to Spain to participate in the Reconquista (the Christian “reconquest” of parts of the Iberian penninsula—today Spain and Portugal—that had been under Islamic rule) before becoming a friar in the Mercedarian Order. This order was founded in Spain to ransom Christians who had been captured by Muslims. There are several conflicting accounts of Serapion’s martyrdom—one story has him martyred by pirates off the British coast, another says he was left for dead, recovered and then was killed in Algiers. According to the Mercedarians, Serapion made several successful hostage rescues. During the last captive exchange the ransom money took too long to reach Algiers and Serapion was killed. The saint was nailed on an X-shaped cross like the Apostle St. Andrew, and dismembered or disemboweled. This horrific martyrdom is the subject of this seventeenth-century painting by the Spanish painter Francisco de Zurbarán. None of the grisly details are evident in this painting—Zurbarán chose to convey this event as a still and contemplative scene. 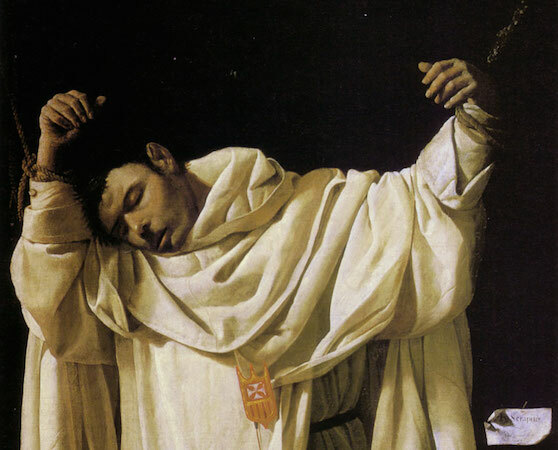 The three-quarter-length figure of Serapion takes up most of the composition; his lifeless body robed in his beige habit emerges from a dark background. The tenebrism (the intense contrast between light and dark) provides a dramatic illumination of the saint’s body and is characteristic of Baroque art in the style of Caravaggio. One can imagine that in a dimly lit room the intensely realistic figure would appear to be emerging from the darkness into the viewer’s space. The only reminder that this is indeed a painting is the small piece of paper where Zurbarán identified Serapion and signed and dated the work. Zurbarán’s primary patrons were monks. He and his workshop sometimes lived in the monasteries they worked for and thus were able to experience and understand the lifestyle of the Order. Monastery life varied from order to order but monks generally woke early to pray and prayed several times a day while also tending to their work around the monastery—writing, copying books, studying scripture, and/or physical labor. Most observed long periods of silence which was meant to free the mind and soul to contemplate God. Zurbarán’s realism and austere, spiritual aesthetic made for a style that was well-suited for the quiet and contemplative monastic environment. This particular painting was displayed in a room where deceased monks were laid out before their burial—so in this sense it was a funerary image. Monks reflecting on death would be confronted by this image of martyrdom and all its spiritual connotations. The Mercedarian Order was founded on the notion of self-sacrifice, ransoming and taking the place of captive Christians. Many in the Order met bloody deaths like Serapion and this element of their origin was ever-present. Zurbarán depicted Serapion with his arms stretched up and tied to a faintly visible tree. 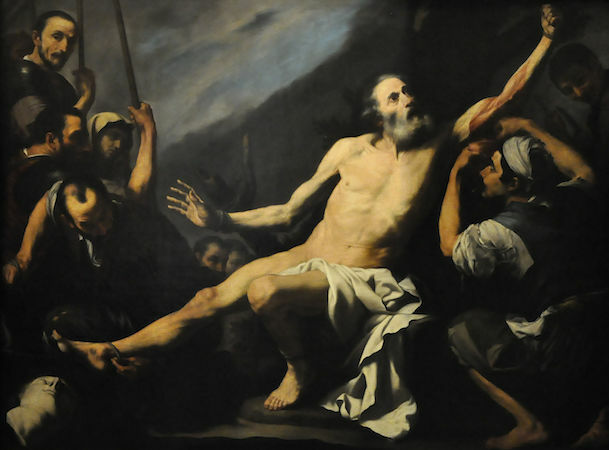 His pose is reminiscent of Christ on the cross, and the fact that Serapion willingly risked his life (as did many Mercedarians) echoes Christ’s own sacrifice. Zurbarán favored a largely monochrome color scheme that adds to the subdued tone of the work. The muted browns and cream colors are pierced only by the small yet prominent red and yellow Mercedarian badge on the saint’s torso. Scenes of martyrdom enjoyed particular popularity in seventeenth-century Spain where the Counter-Reformation spirit was strong (the Counter-Reformation was the Catholic Church’s response to the Protestant Reformation). In England, King Henry VIII’s of Act of Supremacy (which made the King the head of the Church of England) resulted in the persecution of Catholics, especially between 1534 and 1680. The reign of Queen Elizabeth was particularly bloody with many of the martyrs killed by being hanged, drawn, and quartered. St. Serapion was painted in 1628, right in the midst of that persecution. 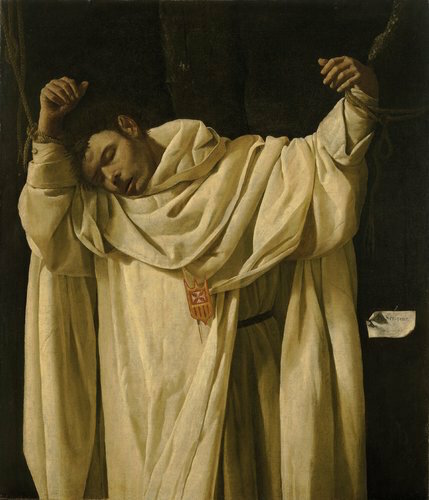 Zurbarán was also commissioned by the Carthusian Order to paint the martyr St. John Houghton who was killed in England by being hung, drawn, and quartered. It is worth noting that Serapion is associated with Britain, whether he was born there or not, he is said to have spent time preaching and recruiting for the Order in London. 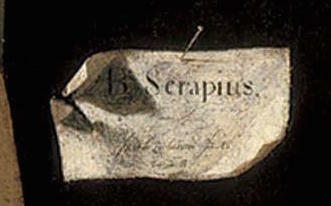 Serapion was beatified (the third in four steps to becoming a saint) in 1625 by Pope Urban VIII and by doing so he was symbolically recalling England’s tradition of martyrs for the faith and providing a model for those who were suffering persecution and the threat of a similar death. 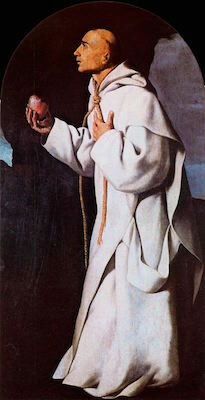 In the painting of St. John Houghton, Zurbarán also omitted any bloody details, instead showing the saint holding out his heart and wearing a noose around his neck. Similarly, St. Serapion’s copious garments conceal any violence done to his body, though his open habit is a reference to his body being cut open. Except for a small welt on his forehead, Zurbarán has omitted any obvious signs of trauma. Compare these images by Zurbarán to the Martyrdom of St. Bartholomew, by his contemporary, José de Ribera, which details the torturous peeling off of the saint’s skin, revealing his blood and muscles. In bypassing the horror of the method of death and conveying a peaceful scene, Zurbarán has emphasized the eternal reward of heaven. Cite this page as: Dr. Melisa Palermo, "Francisco de Zurbarán, The Martyrdom of Saint Serapion," in Smarthistory, August 8, 2015, accessed April 19, 2019, https://smarthistory.org/zurbaran-the-martyrdom-of-saint-serapion/.